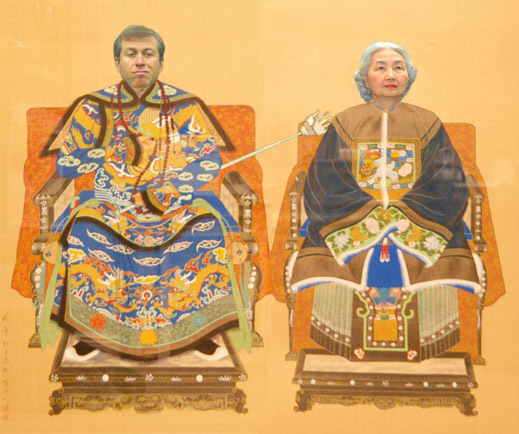 ROMAN ABRAMOVICH FLIES INTO HONG KONG TO DISCUSS WHAT (RUSAL) BUSINESS WITH WHOM (ELSIE LEUNG)? Roman Abramovich (left) landed in Hong Kong on Tuesday afternoon. Abramovich is an influential shareholder in Norilsk Nickel, Russia’s largest mining and metals company, on whose dividends the loss-making United Company Rusal now depends to stay out of the red. Rusal is the Russian aluminium monopoly, but Hong Kong is home to Rusal’s share listing, and its dwindling share price. According to the latest Rusal financial report, the company ran a $47 million loss in the quarter to March 31. Adding $99 million of its share of Norilsk Nickel’s profit put Rusal’s red line into the black by $52 million. But for the annual general meeting (AGM) of Rusal shareholders to consider such matters, Abramovich is 24 days early. The Rusal AGM is scheduled at the Grand Hyatt Hotel in Hong Kong, at 10 in the morning of June 14. At this meeting, a director on the Rusal board, Elsie Leung Oi-Sie (right), is facing a vote of no-confidence. A parallel motion proposes her replacement by a Russian candidate, Dmitry Vasiliev. The moves have been initiated by the 15.8% shareholder bloc of Victor Vekselberg and Len Blavatnik for reasons reported here. They may be supported by Mikhail Prokhorov with his 17.02% of the Rusal shares; his spokesman said today it’s too early to announce how he will vote. If counted together, the vote against Leung may start with almost 33% of the shareholder votes. Another 10.03% of Rusal’s shares are classified as a public float, according to the company website. The largest part of that, 3.15%, was acquired at the initial public offering (IPO) by the state bailout bank, Vnesheconombank (VEB). Six months later in June 2010, VEB’s chairman, Vladimir Dmitriev, said: “We regarded this stake as a pretty balanced one. It doesn’t really guarantee our Bank’s representative’s participation in UC Rusal’s governance bodies, but we have a current credit agreement with the company that provides for our Bank’s representative to be included in the company’s Board of Directors.” In practice, VEB’s board seat was eliminated last year. By then, according to a Rusal filing at its place of registration, Jersey, the Russian state bank stake in Rusal amounted to 10.04%. Exactly how many Rusal shares are in genuinely independent circulation is far from clear. If the independence of an independent shareholder is to be voted on by shareholders independent of the control shareholder, Deripaska’s EN+, with 48.13%, there is likely to be a majority of votes to dismiss Leung and elect Dmitriev. Also, since Rusal’s lenders hold many of the EN+ shares, plus shares in Rusal’s subsidiary production companies in Russia, as security for repayment of the company’s debts, Sberbank, the Russian state bank which dominates the lender syndicate, is in a position to direct votes on the non-confidence and replacement motions, if that’s what the Kremlin decides between now and June 14. To understand Sberbank’s dominance, open Rusal’s recent quarterly report, put Sberbank and security in the search box, then click. A year ago, President Vladimir Putin made his views known on Rusal board candidates, but Deripaska didn’t do what he was told for four months. Rusal’s debts currently total $11 billion; its market capitalization on the Kong Kong Stock Exchange is $7.6 billion. On the day of Abramovich’s arrival, the share price fell by 0.51% to a near all-time low of HK$3.88. When Leung took her seat on the board ahead of Rusal’s IPO, Rusal’s share price started at HK$10.80. Leung said last week that “independent directors act not in the interest of a particular shareholder but in the interest of the company and to see to it that minority interests are protected. The fact that [a] certain shareholder dislikes the decisions in such meetings (which are made by majority decision) is no ground for accusation against the INED [independent non-executive director] or INEDs. If such suggestion is put forward, I shall not hesitate to take legal action for defamation.” Leung has not met with Vekselberg and Blavatnik to hear their case against Deripaska for violation of the shareholder charter and for damage to the company. She explains her refusal to comment on the issues at stake “because the matter is subjudice”. But Abramovich is not a Rusal shareholder. Did Leung meet him in Hong Kong? 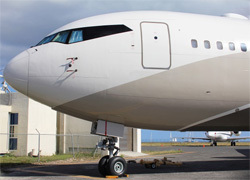 Details of the arrival of his aircraft – nicknamed “The Bandit” by planespotters after the exterior mask-like coat of paint around the cockpit — have been confirmed. The plane was in Sochi on May 15, when Putin was there. It then flew to Nice on May 17 and to Moscow on May 18. From there Abramovich flew east and south to Hong Kong. Abramovich’s spokesman John Mann declined to comment on Abramovich’s presence in Hong Kong. Leung was asked to confirm whether or not she has had, or will have contact with Abramovich while the latter is in the city. She has replied: “I do not know this gentleman”. Asked whether they are making contact in order to get acquainted, Leung has not yet responded. Leung holds independent non-executive board seats at two other Hong Kong-listed companies, whose businesses involve pharmaceuticals and the sale of coal-fired and gas-fired electricity – the Beijing Tong Ren Tang Chinese Medicine Company Ltd., and China Resources Power Holdings. In a separate development revealed this week, Leung’s Hong Kong colleague on the Rusal board, Barry Cheung, has run into serious credibility problems of his own. On the weekend Cheung’s principal business, the Hong Kong Mercantile Exchange (HKMEx), collapsed. Hong Kong police have opened an investigation of fraud, following an announcement from the government market regulator, the Securities and Futures Commission (SFC), that its inquiry had identified “suspected irregularities [which] are serious ones.” HKMEx was stripped of its trading licence. The company’s premises have been searched by police, who have seized files and computers. Three men have been arrested, and Cheung is a target of the investigation. After Cheung was appointed as an independent director on the Rusal board in late 2009, Deripaska’s EN+ holding bought a 10% shareholding in Cheung’s exchange. According to EN+ at the time, “we believe that HKMEx will bridge the international commodities markets with Asia to provide an efficient and transparent pricing platform for end-users and the global trading community.” There has been no public disclosure of how much Deripaska paid for his stake. Representing it on the board is Artem Volynets, who is chief executive of EN+. Volynets is also a director of the Rusal board.